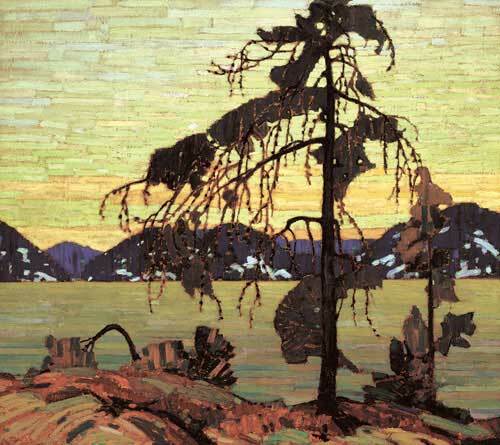 The Jack Pine ~ Tom ThomsonAvailable as a poster print, or as giclée on canvas or paper in a variety of sizes. Most posters, fine art reproductions and limited edition reproductions are printed using the offset lithography process. Typically the image is photographed, colour separations are made and then four to eight colours are run through a printing press to create the images on paper. This process is also used to reproduce daily newspapers or our favourite magazines so it is perfect for productions with a large run. Posters and fine art reproductions are usually printed by the thousands and consequently their price is usually quite low, relatively speaking. As well, limited edition reproductions are often produced using the offset lithography process but are usually printed in a much smaller volume on a higher quality acid- free paper. The quality of the edition, the reputation and skill of the artist all determine the price of these items, which is typically much higher than that of fine art reproductions. Two well-known artists who use this process would be Robert Bateman and Trisha Romance. 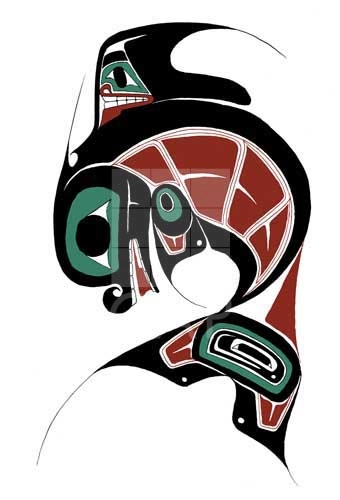 Killer Whale ~ Danny DennisLimited edition giclée on fine art paper. image, including colours, can be made. Sizes and quantities are easily adjusted and the full edition need not be printed at once. Giclée printing is done using a high quality ink jet printer on paper or canvas. When printed onto canvas a UV film is sometimes applied to protect the image against damage, since canvases are not covered by glass when framed. The quality of Giclée printing has improved dramatically during the last few years, in large part due to higher quality ink and printers. This process is often referred to as Print-on-Demand. Typically Giclée reproductions are done in smaller quantities so their price is typically higher than that of offset reproductions. The process of canvas transfer is used to apply a reproduction on paper to canvas. Through the use of chemicals, the inks are separated from the paper and applied to the canvas. A protective UV film is once again applied to the canvas to protect the surface. Canvases can be cleaned with a damp cloth. Canvas transfers typically do not appreciate in value because they can be produced in large quantities, but they are a good alternative to traditional framing, especially with contemporary or traditional images. They also work well with large images or for artwork that is to be hung in a brightly lit area. 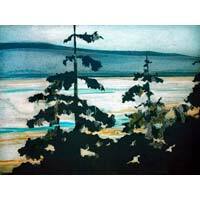 Dusk ~ Doug ForsytheOriginal intaglio print. Original prints including serigraphs, etchings, wood blocks, lithographs and linocuts are made individually by artists called printmakers. Printmaking can be a very complex and time consuming process where the image is imposed into a screen of silk, a metal plate, a piece of wood, marble or limestone. These materials are then inked and applied to the paper manually using a press. Each colour is applied individually on a specific area of the paper. Many plates and many colours are used to create complex images. These original prints are supervised by the artist or assistant and are signed and numbered. Because original prints are produced manually there may be minor differences in each print, but the signature of the artist is an indication that they are as identical as possible to each other. Original prints are often undervalued because the general public does not appreciate the work and talent required to produce these works of art. For those of you interested in collecting art, becoming more knowledgeable about printmaking is a good place to start. Whether you choose a poster, fine art reproduction, limited edition reproduction, giclée print, canvas transfer or an original print, it helps to be knowledgeable about the process so that you are certain about what you are purchasing. But what ever you choose, the bottom line is always, like what you buy!